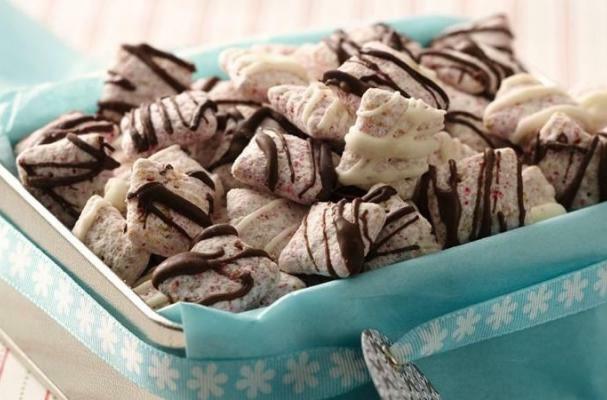 Chocolate peppermint Muddy Buddies will please adults and kids alike. Classic Muddy Buddy snack mix is a chocolate and peanut butter coated corn or rice cereal that is as addicting as it is delicious. This holiday version leaves out the peanut butter and adds a seasonal touch by using peppermint bark flavored cereal instead. This instant snack is great for parties or to pack up into jars and give as a simple Christmas gift. For other homemade edible Christmas gift ideas, click here. To take this snack mix one step further, add mini candy coated chocolates and chocolate covered pretzels. Step 1: Line 3 cookie sheets with waxed paper, foil or cooking parchment paper. Spread one bag of cereal in single layer onto each of the 3 cookie sheets. Step 2: Place semisweet chips and 1/2 teaspoon of the oil in small microwavable bowl. Microwave uncovered on High 1 minute to 1 minute 10 seconds, until almost melted. Stir until smooth. Drizzle evenly over one sheet of the cereal. Place milk chocolate chips and 1/2 teaspoon of the oil in small microwavable bowl. Microwave uncovered on 70% power 1 minute to 1 minute 10 seconds, until almost melted. Stir until smooth. Drizzle evenly second sheet of the cereal. Place white vanilla baking chips and remaining oil in small microwavable bowl. Microwave uncovered on 70% power 1 minute to 1 minute 10 seconds, until almost melted. Stir until smooth. Drizzle evenly over remaining cereal. Step 3: Let stand at room temperature 2 hours or until chocolate is firm. Break up. Store at room temperature in tightly covered container. *For a gluten-free version, use gluten-free Chex cereal and add a few drops of peppermint extract to the chocolate. You can also add peppermint snow (chopped peppermint) to give the Muddy Buddies a more festive look.